“We fought the good fight. 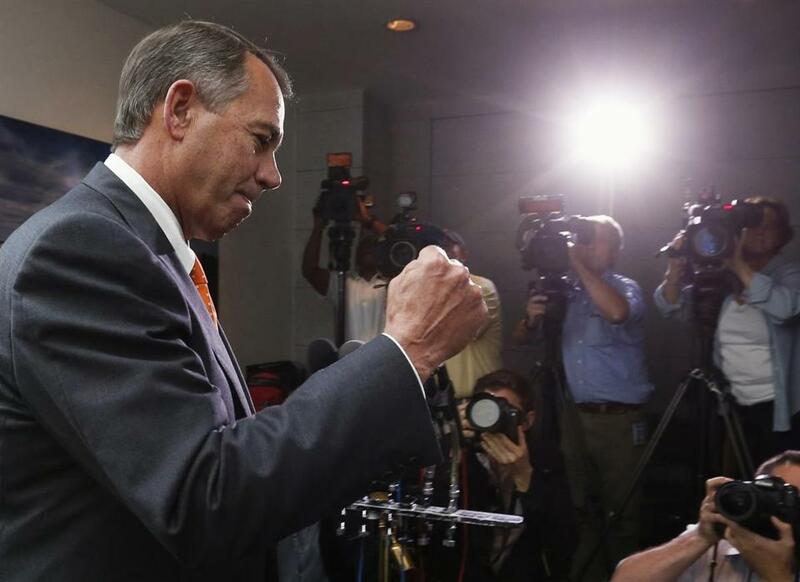 We just didn’t win,” Speaker John Boehner said of one of his most humiliating defeats. WASHINGTON — Congress, dueling to the final hour, voted late Wednesday to avoid a potentially catastrophic default on the nation’s debts and halt a 16-day government shutdown that showcased congressional dysfunction. The last-minute deal, brokered just ahead of Thursday’s default deadline by Senate majority leader Harry Reid and minority leader Mitch McConnell, promises only short-term relief from the cycle of fiscal standoffs that has gripped Washington. It funds the government through Jan. 15 and raises the nation’s $16.7 trillion borrowing limit through early February. Even that relatively modest achievement sent the Dow Jones industrial average up 206 points, with the biggest gains chalked up early in the day as the deal came together. The Senate passed the bill, 81 to 18. Representatives in the House followed, backing it 285-144, with all 198 Democrats who voted supporting the bill along with 87 Republicans. Senators Kelly Ayotte of New Hampshire and Susan Collins of Maine, the only Republican lawmakers from New England, also supported the bill. The White House’s budget office says furloughed federal workers should expect to return to work Thursday morning. President Obama signed the measure just after midnight. Hundreds of thousands of furloughed federal workers were told to report to work Thursday. In the end, Republicans who pitched the pair of fiscal battles promising to gut or delay the president’s health care law got next to nothing in exchange for putting hundreds of thousands of federal workers on furlough and watching their own poll numbers plunge. The only change to the Affordable Care Act was token at best: new language to ensure income verification for poor people who receive health subsidies, underscoring a requirement that was already in the law. “We fought the good fight. We just didn’t win,” House Speaker John A. Boehner told Cincinnati radio station WLW. Boehner, who waited until the last possible moment to face down the conservative members of his party who were driving the fight, said in a statement that he would relent because he did not want to risk defaulting or losing the Republican majority in the House, alluding to political fallout for the GOP in the next election. He attempted to appear strong in the midst of one of his most humiliating defeats, an episode spanning weeks during which he failed to unite his fractious and unruly caucus behind a coherent legislative or political strategy. The episode widened divides within the Republican Party and revealed how little control the GOP has over its own agenda in Washington. Though many arch-conservative Republicans attacked Boehner after previous fiscal compromises in 2011 and the end of 2012, they did not appear as angry this time. That is probably because Boehner, after initially resisting the unusual tactic of attacking an existing law through separate funding and debt bills, sided with the Tea Party faction until the House was fully backed into a corner. Democrats and many mainstream Republicans were frustrated by his unwillingness to end the shutdown that left workers without paychecks and citizens without government services. But Boehner drew a standing ovation during Wednesday’s closed-door meeting with Republicans, many of whom felt they had christened a new warrior. Boehner, along with House majority leader Eric Cantor of Virginia, voted for the bill. Still, most House Republicans — 144 — voted against it. Democrats, who held a hard line against GOP tactics, got most of what they wanted except the security of a long-term deal. Some Republicans took comfort in the notion that they did not lose more ground. The deal requires the government to maintain deep across-the-board spending cuts known as the sequester until at least December, when lawmakers are hoping to craft a longer-term deal to cut the deficit. The pact also guarantees furloughed federal workers will get paid for the time they missed. Leaders separately agreed to establish a bipartisan committee of House and Senate lawmakers to negotiate longer-term budget issues and produce a new agreement by mid-December. Taxes, deficits, Medicare, and Social Security changes will all be on the table. A large-scale deal to trim spending on entitlements and other big budget items has long eluded Congress, most recently in 2011, when an effort to craft a grand bargain fell apart amid rancor between the parties. This effort will be no easier, as many conservative lawmakers will continue to insist on changes to the health care law and many liberals have promised to hold firm against any cuts in entitlements. McConnell was one of many Republicans who seemed relieved to end the spectacle that has damaged his party — with just 24 percent of respondents saying they held a favorable view of the GOP in a recent NBC-Wall Street Journal poll. But there were other conservative lawmakers and groups who were still urging a fight, and criticizing McConnell for caving, highlighting a problem the party has yet to conquer. Club for Growth, which often supports conservative candidates in GOP primaries, urged lawmakers to oppose the deal to reopen the government and avert default, warning it could be recorded and used against them later. While McConnell was selling the deal in the Senate, Senator Ted Cruz, the Texas Republican who became the face of the shutdown, spoke just outside the Senate chamber. Just a few feet away, Ayotte, one of many Republican senators who warned against Cruz’s tactics, grew visibly angry when she heard some in her party wanted to come back for more. Representative Peter King, a New York Republican, was even angrier, and more blunt in his critique of Cruz, who has quickly become the most polarizing figure in the Republican Party. The conservative foot soldiers who fought along with Cruz remained unswayed throughout the ordeal by appeals from King and other establishment voices, including the Chamber of Commerce, conservative strategist Karl Rove, and former Florida governor Jeb Bush. The insurgents sounded defeated on Wednesday, but hardly chastened by the experience. The fight that preceded Wednesday’s deal has prevented Congress from doing anything else for most of the past month. Once-prominent discussions over national security were halted. A bipartisan push for an immigration overhaul lies dormant. “We’ve missed the opportunity, totally,” said Senator Bob Corker, a Tennessee Republican who had been meeting with White House officials on entitlement changes and had urged against the latest standoff. Senator Lindsey Graham of South Carolina said the Republican Party needs tbegin resisting pressure from conservative interest groups to fight unwinnable battles.